If you aren't going to the giant bike swap in Westminster, MD this Sunday then head on out to the Lake Redman trail work day in York, PA where they'll be cutting new singletrack. 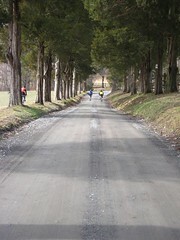 Details: February 10 - Trail Work - Lake Redman Boat Launch - 1PM - organized by YAMBA. The snow is gone, just like it was never here. Warmer temps and rain took it all away. 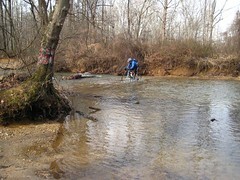 Even here where the trails are mostly rocks and hold up well to the water, things can get too wet to ride. What to do? Hit the road, but that alone is not good enough for me. Sure, the road can be good but it's not where my heart is. Dirt is what I crave, maybe I ate too much of it as a kid, maybe I didn't eat enough. Who knows. A bit back I coined this term: 1903 Adventure Ride. 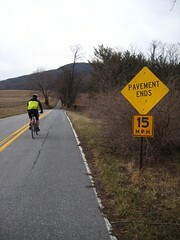 It's what I use to describe the road rides where I seek out as much unpaved stuff as possible. Why 1903? That was the first year of the Tour de France and they were running fixed gear bikes and there sure wasn't pavement. Luckily there are still a good number of dirt and gravel roads in this county. With a little planning, no matter what direction you strike out in, you can link a bunch of them together. Unpaved roads, skinny tires, fixed gear, high speed, it will help get your fix when the trail isn't an option. So that's what we did this weekend, four of us rolling from my place, winter warmer ale in the water bottles, chilly temps to start, lots of dirt roads. Beautiful day, lots of good fun. Major stream ford early on, tried to minimize the wet feet since it was around mile 13 of a 45 mile ride. Wet and muddy roads. Gray mud spatter covered bikes and bodies, no flats, no mechanicals. Well, at least not ones that were obvious on the ride. That loud clicking noise on Jon's bike? Oh yeah, that was his cracked chainstay. Rounded it up at the brew pub for food and carbo loading. Another good day in the saddle. A cool painting of Sheldon Brown done by his brother with a title that is both fitting and understated. Apparently Sheldon Brown has had a heart attack and passed away (confirmed at Harris Cyclery). Very sad, especially considering he has recently been having health issues that have prevented him from enjoying his passion of bicycling. He's contributed huge amounts of knowledge to not only fixed gear and single speed riders, but cyclists in general. No doubt he will be missed by those close to him as well as the countless cyclists he helped in all of his years.